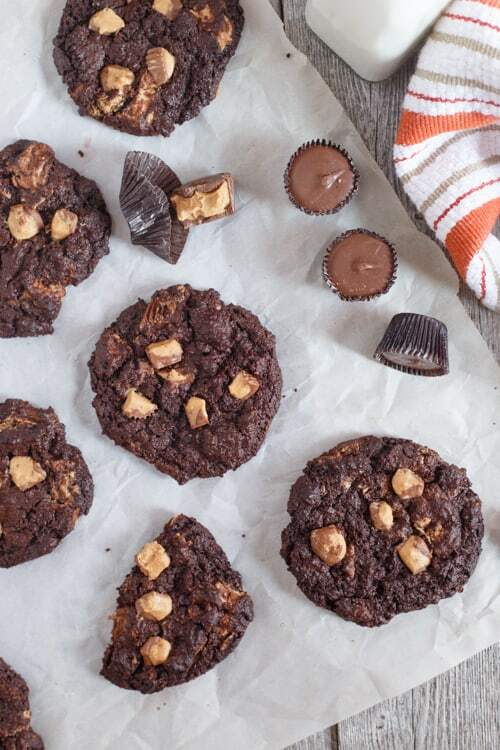 An indulgently delicious and perfectly moist Gluten-Free Chocolate Peanut Butter Cup Cookie recipe. Seriously, these creative gluten-free cookies are addictively good! So I know at this point we are supposed to be 100% focused on all things Thanksgiving (and Christmas apparently*, as the massive bombardment of t.v. commercials are telling me), but Halloween is actually still on my mind. My good friend Kristie apparently enjoyed a healthy dose peanut butter cups at our little Halloween soiree a couple weeks back, as evidenced by the pile of orange wrappers conspicuously stacked where she sat most of the night. I was a bit surprised by her impressive peanut butter cup consumption, but not for the reason you may suspect. She’s intolerant to gluten and needs to follow a pretty strict diet. Could it be that peanut butter cups are gluten-free? Indeed they are, as Kristie confirmed for me (and I reconfirmed on their website). *side rant: Advertisers, I get it. You want to get us thinking about Christmas as early as possible. But can’t we enjoy and celebrate one holiday at a time? Don’t even get me started on hearing Christmas songs on the radio. I’ll boycott your station until the day after Thanksgiving, at which time I will happily surround myself with the sounds of the season. But until that time, let’s enjoy the season we’re in. Phew, thanks for that vent-fest. Back to these cookies. Now I know that cookies sans gluten are normally characterized by a lovely texture that can be at best described as dry, gritty, and crumbly. That’s why when I see a baked good labeled as gluten-free, I typically start walking backwards very slowly. But hey, I was pleasantly surprised when these cookies came out of the oven tasting super moist with that desirable elastic chew. I even immediately had some friends taste them and when I mentioned they were gluten-free, there were looks of pure shock, awe, and amazement. Yup, that’s right. So why chocolate peanut butter cookies? Well, do you know about Levain Bakery in NYC? They are without a doubt home of my favorite cookie in Manhattan. My usual order is the Chocolate Chocolate Chip Cookie (how’s that for alliteration?). But recently, I’ve been totally digging their Chocolate Peanut Butter Cookie. And that’s weird because I was never into the whole chocolate – peanut butter combo. I know, don’t judge me. I’m understanding it now… it just took me awhile. Gotta give credit where credit is due. This cookie recipe has been slightly adapted from Yammie’s Gluten Freedom. 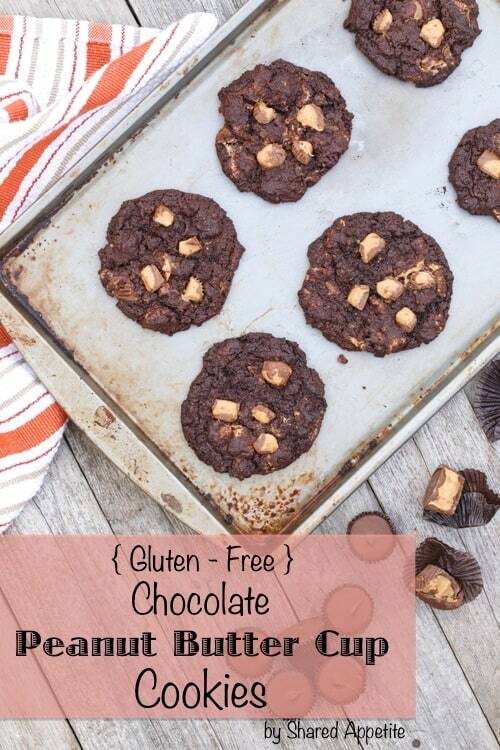 Check out her site for a ton of amazing-looking gluten free recipes! Combine butter with brown sugar and white sugar until well incorporated. Stir in egg and vanilla extract. In a separate bowl, combine baking soda, Kosher salt, and cocoa powder. Add to wet ingredients and stir until just combined. Gently fold in chopped peanut butter cups. Using heaping tablespoons, drop cookies onto ungreased sheet pans and bake in a preheated 350°F oven for approximately 10-12 minues. Nicely done cookies…I think it is awesome how there is no flour in them. I bet they are nice and chewy and delicious and now I need to get some breakfast before I start drooling over my computer. Yummm!!! I’ll pretend they’re healthy too… And I know it’s totally criminal, but I’m one of those annoying people that’s already thinking about Christmas! Bad. Bad. Bad! Okay, I’m glad we are on the same page with pretending they are health food 🙂 Haha, it’s hard not to think about Christmas. I don’t blame you… we are brainwashed everywhere we look 🙂 And honestly, I’ve already started Christmas shopping! You sold me as soon as you said these are chewy! My mom and sister have to eat gluten free and I’m rarely happy with the way baked gluten free goodies come out! 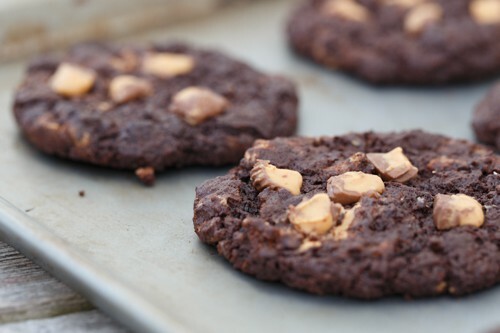 I’m going to have to try these – I am such a sucker for the peanut butter / chocolate combo! Mmm, these look soooo tasty. It makes me want to eat gluten free cookies all the time. Ok, maybe that’s an exaggeration. 😉 But I definitely want to try these. AND Levian Bakery cookies… on my bucket list! Haha, you’re so funny! Yes, I’m not ready to commit to gluten-free cookies only either. I love me some gluten. You TOTALLY have to get to Levain Bakery. They are pretty darn perfect. Smile. I agree. I don’t want to get to Christmas yet! I do want to get to these cookies though! Thank you for sharing yet another delicious recipe with us! I hope you have a good end to your week! 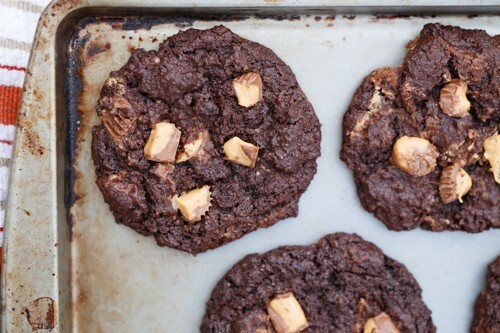 I love peanut butter cookies, but with chocolate added in I’m in heaven. Looks amazing!